Global Web Index data from their brand new GWI Social report to show that Pinterest, Tumblr and Instagram were the fastest growing social networks in 2014. 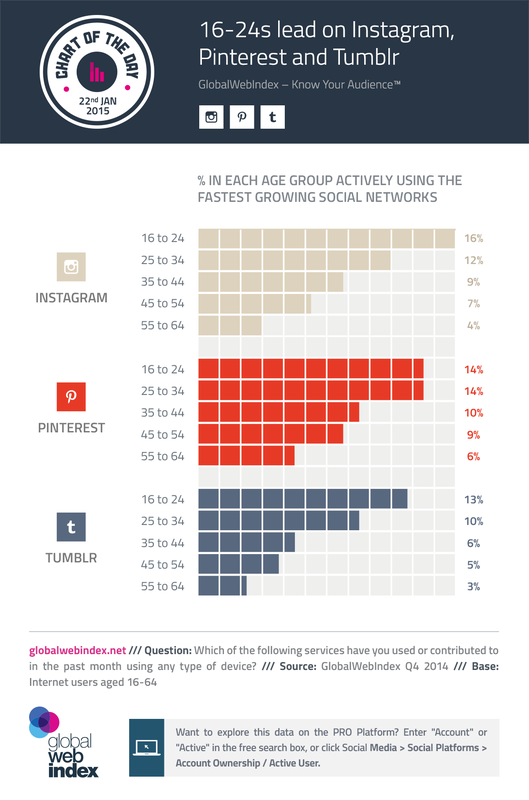 Today, they posted an infographic about the active usage on these three platforms by age. Clearly, 16-24s are at the very forefront of their growth – and it must be particularly telling that this group’s active usage of Facebook was down by 11% across 2014. It’s not that they’re leaving Facebook in any serious numbers, though, it’s just that many activities which used to take place on Facebook itself have now migrated elsewhere.One consequence of this is that Facebook will be looking for new ideas, and new audience types, to maintain momentum and keep investors/headline writers happy. Enter services like Facebook at Work as well as its new offering for Tor users – both of which represent ways to increase engagement among existing audiences (LinkedIn’s age profile is extremely similar to Facebook’s, for example). We can expect to see more announcements like this throughout 2015.